The Navy is pursuing improved information-based capabilities that will enable it to prevail in the higher-threat, information-intensive combat environments of the 21st Century. This document outlines challenges anticipated over the next 15 years in the operating and information environments, and highlights long-term opportunities for fully integrating Navy’s information-related activities, resources, processes and capabilities to optimize warfighting effects and maintain decision superiority across the spectrum of warfare. The Navy’s plans for achieving Information Dominance center on: 1) assuring command and control (C2) for our deployed forces regardless of the threat environment; 2) enhancing battlespace awareness to shorten the decision cycle inside that of the adversary and to better understand the maritime operating environment; and, 3) fully integrating traditional kinetic and emerging non-kinetic fires to expand warfighting options to both Navy and Joint commanders. To accomplish these plans, today’s current information-based capabilities involving Assured C2, Battlespace Awareness, and Integrated Fires will require continual changes and improvements in a number of diverse areas. Assured C2 will require a more robust, protected, resilient and reliable information infrastructure that undergirds the Navy’s overall information environment and allow uninterrupted worldwide communication between deployed units and forces ashore. Navy’s information infrastructure must be able to maintain essential network and data link services across secured segments of the electromagnetic spectrum in order to transport, share, store, protect and disseminate critical combat information. Battlespace Awareness will require enhanced information content, advanced means to rapidly sense, collect, process, analyze, evaluate and exploit intelligence regarding our adversaries and the operating environment. Our information content will serve as the basis from which nearly all decisions will be made, enabling our forces to more effectively maneuver and coordinate actions that target and engage enemy forces. Integrated Fires will require new capabilities to fully employ integrated information in warfare by expanding the use of advanced electronic warfare and offensive cyber effects to complement existing and planned air, surface and subsurface kinetic weapons within the battlespace. Future information effects will be designed to impact and change adversary behavior, or when necessary, to control, manipulate, deny, degrade or destroy his warfighting capabilities. Navy Information Dominance is defined as the operational advantage gained from fully integrating Navy’s information capabilities, systems and resources to optimize decision making and maximize warfighting effects in the complex maritime environment of the 21st Century. 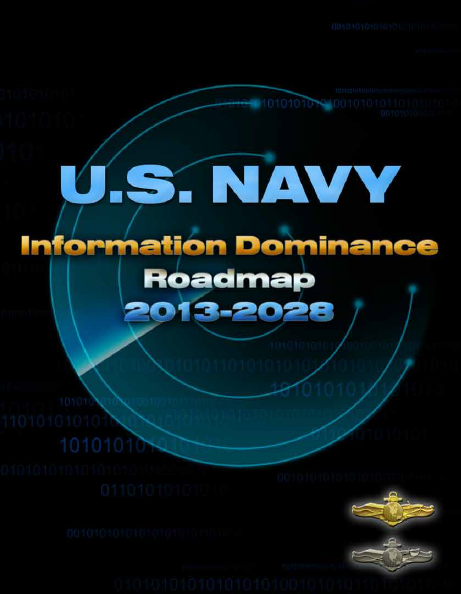 The development of a Navywide Information Dominance capability is being driven by trends within the worldwide information and operating environments, which are predicted to stress U.S. Navy freedom of movement and capabilities in future conflict. Today’s steady-state operational environment can be characterized as one of increasing competition and rapidly changing technological advances. U.S. military operations take place amidst a backdrop of rising military powers, a diffusion of military capability flowing to non-state actors, and greater access by individuals and small groups to lethal weapons, sensors and other technologies. In this environment, the U.S. Navy freely operates as the dominant maritime power. Moreover, the U.S. military enjoys superiority on the land, air and sea, as well as in the space and cyberspace domains, and this U.S. asymmetric advantage is due in large part to our assured C2 capabilities. However, rapid advances being made by other nations in science and technology, expanded adoption of irregular warfare tactics by both state and non-state actors, proliferation of long-range precision weapons, and the growing use of cyber attacks are all increasingly constricting U.S. military freedom of action. • Small numbers of sophisticated weapon systems can have a dramatic effect on the operational environment. Nations are facing rapidly changing and increasingly complex information and cyberspace environment. Emerging information technology (IT) systems are often being developed and implemented faster by the civilian sector than by worldwide governments. In this setting, the U.S. Navy continues to operate from the information “high ground,” employing superior intelligence and network technologies faster than our adversaries. However, the Navy’s relative advantages are eroding steadily as some adversaries are now actively exploiting modern information-based capabilities and technologies for their own use. In some areas, our adversaries are beginning to develop information-based offensive and defensive capabilities that rival our own. In other areas, many are simply using the internet and the commercial global information grid as their own C4ISR system for networking their low-technology military forces. According to the National Intelligence Council’s Global Trends 2025: A Transformed World and Global Trends 2030: Alternative Worlds, the future international system will be almost unrecognizable from previous decades owing to the rise of emerging powers, an increasingly globalized economy, an unprecedented transfer of relative wealth and economic power flowing to Asian states, and the growing influence of several non-state actors. The U.S. will remain the single most powerful country in the late 2020’s but will be less dominant on the world stage, and will see its relative strength—even in the military realm—decline. The ongoing shift in relative wealth and economic power flowing from West to East is expected to continue. The world will move towards an even more globalized, multi-polar international system where long-standing gaps in power between developed and developing countries will narrow. Of primary concern to U.S. planners, such multi-polar international systems have historically been more unstable than bipolar or uni-polar ones, suggesting the next twenty years of transition to a new world order will be fraught with instability and risks. Within this future international system, the U.S. Navy will continue to play a significant role in global maritime security. • By 2015, computer chips will have evolved from silicon transistors to nanomaterials. • Computing power is expected to grow exponentially in the next 10–20 years, with computing speeds over 1,000 times faster than today’s supercomputer. • New data storage techniques such as “nanotechnology-enabled memory” will vastly increase the capacity to store and transmit data. • In terms of bandwidth (ashore), supply will exceed demand. • By 2025, given other advances in science and technology, quantum computing will be possible. • With advanced information technology, weapons proliferation (to include conventional, cyber and weapons of mass destruction) will spread and could improve the disruptive and destructive capabilities of a number of state and non-state actors. • Such proliferation may allow adversaries, be they non-state or rising state actors, to achieve limited parity or even superiority in selected niche technology areas. • Ubiquitous sensors of various types and sizes could soon saturate the operational environment, and these capabilities will eventually be available on the world market for a price, giving any threat resourced to purchase them the means to enhance their strike capabilities.